Cooper Lighting Iris® Collection 3-Inch Recessed housing in matte black painted finish, features double wall construction. This round housing accommodates MR16 lamp that has voltage rating of 120-Volts. 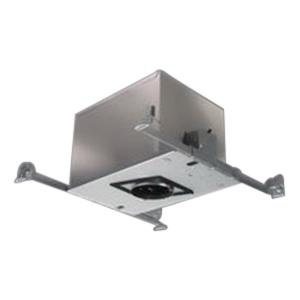 It is insulated air-tite ceiling mountable. It measures 15-3/4-Inch x 10-Inch x 9-Inch. Toroidal transformer offers high-efficiency and very low noise. Bar hanger adjust up to 24-Inch and has integral nail as well as tee grid clip. Housing is cULus listed.